Do you struggle with finding enough time to create new content for your business? Maybe you don’t think you’re a good writer, but you’ve heard blogging can help your business. Or you feel like you don’t have enough hours in the day to answer customer support questions? Have you consider adding live-streaming video tools such as Blab to your business? Live-streaming can be a valuable asset that can help your business if you find you’re short on time. In this article, you’ll discover eight ways to use Blab for business. Wondering what Blab is? It’s a live-streaming platform that enables a public video chat among four participants at a time. To get started, all you need is the Blab app or you can Blab from your desktop and a topic. If you need a tutorial on using the Blab interface, check out this complete guide. In the meantime, let’s look at some ways you can use Blab in your business. Want to hold your own event like Apple? You don’t need a big budget or lots of spectacle and lights. Instead, you can use Blab. You’ll be able to leverage your businesses audience on social media, leading up to the big reveal. If you do plan to announce a new product, you can setup a pre-order page to capitalize on the buzz you’ll generate. One of the biggest challenges most businesses face is that they don’t have enough time to generate enough content. This is where using Blab for business can really help! Instead of spending hours writing a blog post, only to have a handful of people read it. You can turn your blog ideas into a video chat. This way you can have a live discussion with viewers and answer any questions that come up during the chat. Because Blab’s can be recorded, if you decide you want to create a blog post, you can also embed your recorded Blab and add it to your post. Does your business get a lot of the same questions? Instead of answering the same questions over and over, your business can create a Blab where you address customer support questions. Because your video chat is recorded, you can give each of your customer service team a list of Blab’s that address these questions. This way they can share them with customers when they get asked about them. If you want to take it a step further, create a resource page for your business along with an entry on each question. This way you’ll be able to improve the speed in which you answer customer support questions. Another example of how your business can use Blab is for webinars. Webinar usage is on-the-rise. In 2015, 35% of webinars integrated social media applications. Did you know that Blab already does this though! With Blab, you’re essentially holding a live webinar. You could say you’re holding a blabinar! You can blab from your desktop or mobile device. You also don’t have the high costs or challenges with installing plugins just to run your webinar. Simply create your own Blab and share the URL. It’s that easy! Another way to use Blab for business is to establish yourself as a thought leader. Maybe you want to discuss a particular topic? For example, in a recent Blab, my friends discussed the importance of relationship sales, marketing and customer support. You can view their Blab below. In your own business, think about some of the topics you’re known for (or want to be known for) and consider creating your own Blab where you share your knowledge about this topic. Did you know, when you create your own Blab, you get your own unique embed code, downloadable audio and video. If you’ve been thinking about starting a podcast for your business, why not use your Blab content for this. Simply download you file and upload it to your podcast hostI. I recommend using Libsyn for this. By turning your Blab into a podcast, you’re not having to record the same session multiple times. Record once, and use it in many places! Another creative way to use Blab for business is to hold breakout sessions at an event. For example, let’s say you presented on a topic and you want to hold a training session to address this in more detail. You could start a blab and bring together your audience that’s in the room with you as well as your online audience. 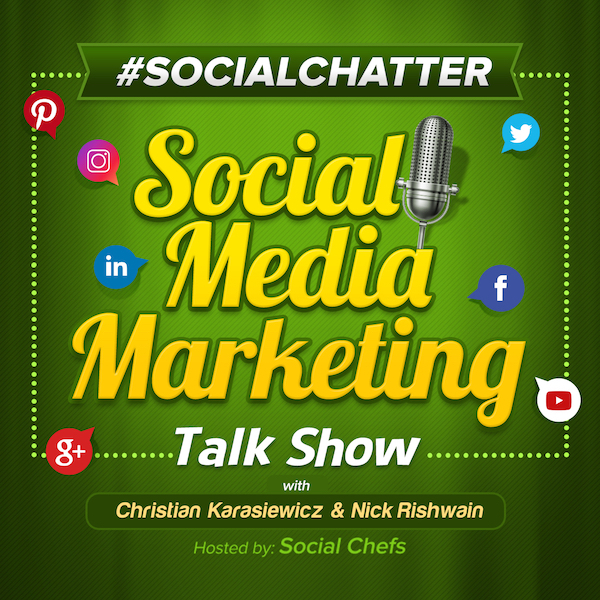 At Social Chefs, we’re also using Blab to share weekly social media updates with our audience. You can take this concept and adapt it to your industry. These are just some of the ways to use Blab for business. What’s great about Blab is that there aren’t really any rules on how you use it in your business. If you can think of a viable way in which it will work in your business, I suggested you create your own Blab and test it out to see what kind of traction you get. For some business, you may need to run a few Blabs before you start seeing results. Just a quick reminder, once you’ve decided on how you plan to use Blab for your business, don’t forget to notify the people on your email list as well. This can be a great way to not only increase viewership, but also convert your email subscribers to Blab users! Besides the ideas I shared on using Blab for business, can you think of any other ways you plan to use Blab to help grow your own business? This is an awesome article as well! Thanks Christian for the great resources! That was fast @craig_campana:disqus! If we left out any other ideas, please share them – we would love to see how others are using Blab. Thanks @craig_campana:disqus. There’s so much potential with Blab. Hopefully more and more businesses will start using it. I have exciting plans for Blab. I am building my new brand through Blab, and have started 30 Days of Blab on 9/21/15, and have committed to put out 30 days of quality content, interviews and workshops that will help me brand myself as a Blab Coach to those I work with that are unaware of its tremendous applications for their businesses. Just wondering if you’ve been able to track any traffic coming from Blab on over to your website. Great question @robbgorringe:disqus. We have. At the same time, we try to incorporate a handful of website links into our weekly show. We’ve also had a lot of guests reach out through our other social media properties – YouTube, Twitter and so forth, telling us they’ve been following the show. I think as more users start using Blab, we’ll start to see even more traffic from it. I think it’s how you structure your show that helps you drive some of that traffic. Having touchpoints in the show rather than just running a Blab, having people watch and expecting them to know to come over to your site. There’s some work on the part of the host and co-host to make that happen. Right on, Bro. Appreciate your reply//. @robbgorringe:disqus, if you have any other questions on generating traffic from Blab, let us know. We’re happy to help brainstorm ideas. Thanks again for stopping by. Anytime @robbgorringe:disqus! How are your Blab’s working out? Are you generating any traffic back to your website from your shows? Would love to hear your process and if it’s any different from what we do here at @socialchefs:disqus. I’ve only done a couple blabs so far, but I’ll keep an eye on it, because Blab could very well be a ‘best kept secret’. Blab could be a “best kept secret.” I think if you can build an engaged following, you should have no trouble getting people to Blab and then back to your website without any issues @robbgorringe:disqus. They’re both very good tools. When I put this article together, Periscope didn’t have the tie-in to your Twitter stream or GoPro integration. I think Blab and Periscope have their own benefits and if you’re trying to decide between the two, test both of them out to see which one fits the needs of your business. Also look to see where your customers are at. If they’re on Blab and not Periscope, you have your answer. Yes, Periscope ties into your Twitter stream, but if your followers view your tweets a day late (and it happens with those I follow all the time) they’re left with an anti-climactic dead link. (…that’s kind of a bummer if you ask me). But I see what you mean. Both are good in their own rite. @robbgorringe:disqus, that’s a good point. I think that’s something you shouldn’t have to be concerned about necessarily though. What would be best is if you educated your audience. Maybe reply under your tweet that the Periscope is finished? Would love to see the ability to expire Periscope streams so that you didn’t always have to constantly monitor this. It a way, you’re right, it creates a poor experience for your followers, yet it’s something that’s not necessarily you can control (correctly). Both rely on using Twitter. We like Blab because it’s available from a desktop or mobile device; however, Periscope wins major points for being available directly in your Twitter stream and also because you can use it with a GoPro as @ckarasiewicz:disqus mentioned which makes it very useful if your business relies on those types of devices.